One of the main reasons to do a Members Voluntary Liquidation is to maximize the CGT concession benefits where there are proceeds from the sale of a pre-CGT asset or where there are Small Business CGT concessions available. 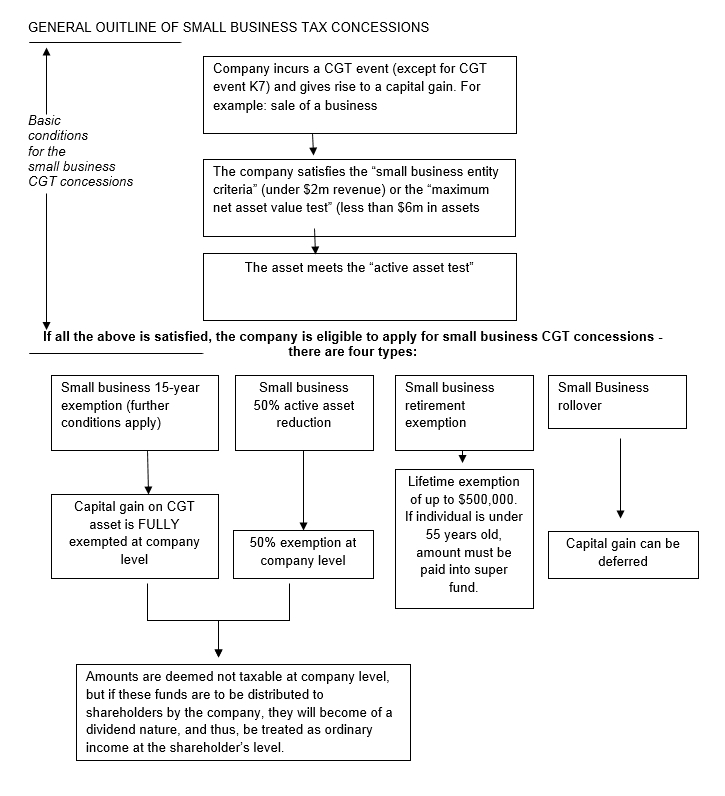 Below are some details on the Small Business CGT Concessions and then we explain the significant benefits of a Members Voluntary Liquidation in getting the proceeds of an asset sale to the shareholders. You should obtain advice from your tax accountant to see if you qualify and meet all of the conditions. But in general, where a company is eligible to apply for the first two types of concessions above, part or all of the capital profits arising from a CGT event may be exempted from tax at the company level. However, when the amounts are distributed to shareholders (via a dividend), the amount becomes ordinary income, and thus, taxable. The only exception is when the distribution is made by a Liquidator. When a liquidator makes the final distribution, capital profits are treated as “capital proceeds” from the cancellation of the shares. That can result in a very significant tax saving. Please note that the above only applies to the distribution of the capital profits. If your company has retained earning (which is also subject to distribution), the amount will be deemed dividend and taxable. We suggest that you firstly discuss the sale of your business with your tax accountant to see if you will qualify for the Small Business CGT Tax Concessions and if so, you should then contact us to receive the extra tax benefits received through a Members Voluntary Liquidation.